It is never a pleasant experience to be involved in a car accident. In the moments immediately following a vehicle collision, your body might be hurting, your nerves could be rattled, and you might already be stressed about how much this is going to cost you. The reality is that a car accident can put a significant drain on your financial resources as you struggle to work towards vehicle repair or replacement, and lost wages if you are forced to take time off from work while you recover physically. Beyond that, auto insurance companies tend to have a policy of “delay, deny, and defend,” which can make things even more difficult for you in the weeks and months that follow. If anyone has been seriously injured in the accident, you may need to use a first aid kit to stabilize the victim until help arrives. Your health is the most important consideration in the aftermath of a car accident. Make sure that you get proper medical treatment for any injuries sustained in the crash. Your insurance carrier may need to see a police report that confirms the details of your auto accident. Even if the other motorist does not want to contact law enforcement, you should do so. Someone who witnessed the car accident might prove helpful to you later. Speak with witnesses and get their contact information in case your attorney needs to talk to them again. After your injuries have healed, it is good to have photographic evidence of any visible injuries you sustained. 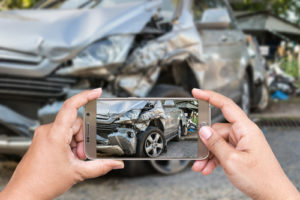 Depending on the nature of your claim, and depending on whether the case goes before a jury, you may be able to obtain a greater damage award if you have photographs. You should always consult an attorney before speaking to an insurance adjuster about your car accident case. The insurance company is more likely to take your claim seriously, and offer you a fair settlement if you have a qualified attorney on your side. Were you injured in a car accident in New Jersey? Then it is important for you to take immediate action and contact a qualified personal injury attorney. The experienced personal injury lawyers at Team Law are prepared to assist you with your accident claim and help you get the compensation you deserve. Contact us today for a free consultation. ← Why are so many New Jersey disability claims denied?